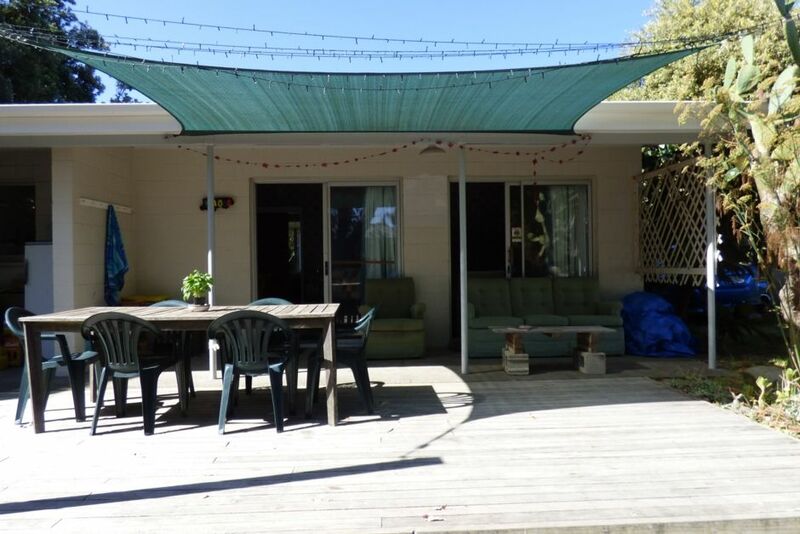 A New Zealand classic bach designed for families, built in the 1970s, set in a fully fenced quarter acre section with beautiful trees and room to play cricket. On a back section, protected from the wind and quiet but only one minute's walk down the drive to the safe surf beach. Bring your kayaks as we are only ten minutes walk to Ohiwa Harbour which offers wonderful kayaking. Please note it is a very comfortable bach but suits people who want to experience the bach rather than holiday home experience. Safe for toddlers or dogs as it is fully fenced. Open plan living with two bedrooms in the bach and two more bedrooms in a recently built sleepout. Only one bathroom but cleverly designed with two showers (one outdoors) and two toilets. Fully equipped with washing machine, microwave, highchair and portable cot. Although we ask you to bring your own linen there are plenty of duvets and blankets. Although it sleeps 9 it is really only suitable for 6 adults. The other beds are more suitable for children as they are divans. There is a pizza oven that you can use. However you cannot use driftwood so you will need to bring your own wood. If you want to use it please let us know and we will send some instructions and suggestions about where to get suitable wood. To complete the bach experience there a range of family board games. There is no TV but there are speakers if you have a laptop to view DVDs. Please note there is a cleaning fee. So treat yourself as this means you do not have to do any cleaning when you leave. We just ask you leave the bach tidy and swept. Hi My name is Sue and I am the eldest of four who along with our mum own the bach. I manage the bookings and cleaning, my sister does the accounts and my brothers organise the maintenance. Our mum and dad built the bach and it is a much loved place for our family. At Christmas time everyone gathers, put up the tents and spend a week or so together. This year my mum who is 90 had all her children, grandchildren and great grandchildren stay for at least three nights. 1 minute walk to the beach and 10 minutes to the harbour, great for kayaking and fishing. Mum has planted trees so the section has shade from the hot midday sun and there is a swing to entertain children. We love the large deck we added ten years ago and tend to spend most of our time out on it during our family holiday. The bach has direct access to the beach - we are down a right-of-way with direct access to the beach. Walk up the drive, cross the road and there is the beach. There is a dining table inside in the open plan living room but also an outdoor table where eat mostly during the summer. Another great weekend at a great kiwi bach. This is the 2nd time we have stayed at this Bach and we look forward to staying again, great location and it has everything you need. Thank you for letting us stay again. Thoroughly enjoyed the hassle free experience; all the board games and good ole kiwi activities. Appreciate the basic necessities. Will definitely use again and highly recommended. Glad you enjoyed the stay. We loved our second visit to your wee bach. Basic but provides everything you need for a weekend away. Clean and tidy, lots of space and just a nice place to be. Thanks!! Great Bach. Had everything we needed. Loved the outdoor shower. Was clean and well stocked. Would definitely recommend. We really enjoyed our stay at this kiwi family bach. We loved being close to the beach, exploring the shady quiet garden and cooking pizza in the outdoor oven. The location was perfect for long beach walks, bike rides and exploring Ohope's many attractions. The bach is well equipped and the beds were comfy. Thanks Kim for the lovely review. Great that you used the pizza oven.